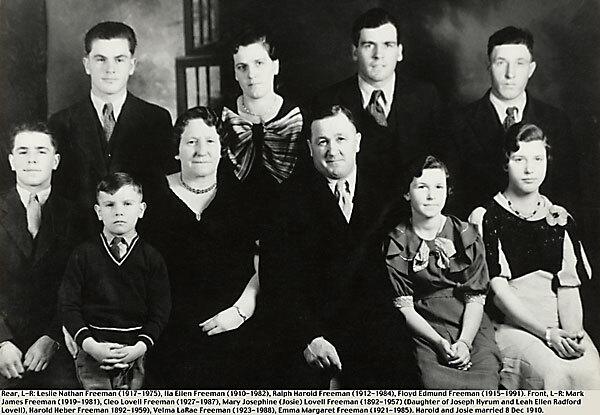 Mary Josephine (Josie) Lovell, daughter of Joseph Hyrum and Leah Ellen Radford Lovell, was born 6 July 1892 at Shelton, Idaho and died 7 March 1957 at Idaho Falls, Idaho. Harold Heber Freeman was born 15 June 1892 in Salt Lake City, Utah and died 7 February 1959 at Idaho Falls, Idaho. They were married 8 December 1910. Nine children were born to this marriage.